I love photographing architecture, especially interiors. Each one offers its own idiosyncrasies that have to be addressed either at the time of photography or in post production. 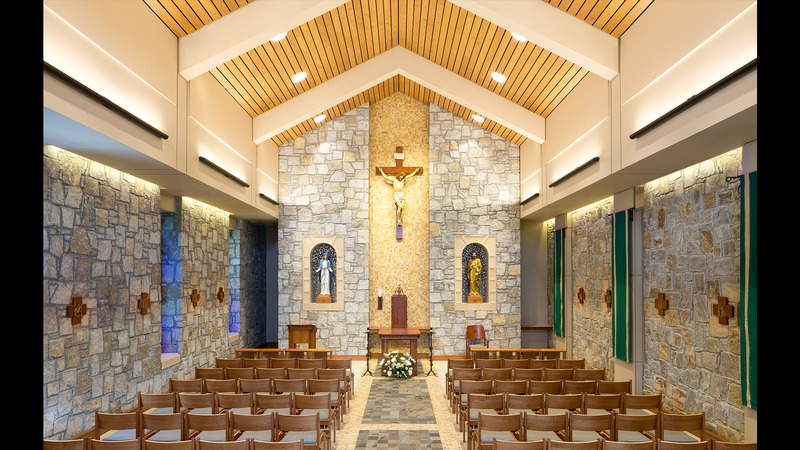 The beautiful St. John Neumann chapel in Lilburn, Georgia is the subject of this post. Walking into an amazing space is always a thrill for me. I see the work that went into the design. I notice the attention the architect gave to the lighting. I become very aware of the furnishings. Then I see the distractions… an exit sign, emergency lighting, speakers in the ceiling, a non-working set of wall washers and hymn books under the chairs. When ever possible, I do my homework by scouting the location first. I take notes with my iPhone’s camera and Notes applications. When a client is giving me rapid fire info, I record it. Preparation a.k.a.–doing your homework–is the best way to make great photographs for a client or yourself. Here are the go-by pictures from my iPhone 6 during the walk through with the architect who designed the space, Terry Biglow. After the walk through with Terry, we met with the facilities director who had given prior approval for the photography. Terry also wanted an entry way exterior and one that showed how the chapel connected to the church. I went back to the location that evening to watch the light as the sunset and evening began. This told me the exact time I had to make these two photographs. Since they would be made at the same time, I would bring two cameras and tripods. I added those to my list of images to produce. Back at the studio, I put all of the information in writing, including the number of photographs requested, the go-by photos from my phone, a timeline, a price estimate, a license of rights to display the work and my terms and conditions into a single pdf that I sent to him for a signature. Once it came back signed, I scheduled the shoot. No job starts until the paperwork is complete. …was the second longest day of the year so the start time was 4:00pm. The first image was the over all view of the chapel. An architect, like Terry, pays a lot of attention to the lighting in spaces he creates. I understood from scouting with him what he wanted to see. This meant making a series of photographs at different exposures that could later be merged together. This would give an accurate representation of the existing lighting. I brought lights just in case they were needed. They weren’t. The second consideration for the chapel was the camera position. I’ve found, with few exceptions, the worst place to put the camera is at eye level. My Canon 1Dx with a Sigma 20mm f/1.5 lens was just under the exit sign in the entryway. I use a Really Right Stuff Versa TVC-45 tripod with a center column to raise the camera to the desired height. The high angle opens up the chairs and makes the aisle appear wider. This means bringing a ladder along on the shoot. My MacBook Pro tethers the camera so I can shoot and review the photographs. I can’t stress how important tethering is. I check the composition, focus, exposure, color and look for anything that might be out of place. It’s so much easier to move something out of the frame before making the final photograph than it is to have to clone it out later in Photoshop. …shows the work that has to be completed in post production. The round white speakers in the ceiling, the emergency lights and of course, the exit sigh have all got to go. They are the equivalent of a blemish in a portrait. Additionally one bank of wall washers was burned out and couldn’t be fixed in time for the shoot. The candles on the altar and the tabernacle lamp would be lighted in post as well. The final crop would eliminate the window that did not have stained glass. The final version is in the header of this post. The camera was leveled so the vertical lines of the windows, wall joints, inlaid tile framing the crucifix and banners are parallel. The raised lectern, tethered MacBook, ColorChecker Passport and the shot list. …posed a bit of a challenge. When I set up the shot, I chose to have the camera height close to the statue’s waist. This made the lectern too short by a few inches. The solution? Raise it up by placing a prayer bench under it on either side. The higher camera position reveals the bible that is barely showing in this behind-the-scenes shot. Three plastic chairs raised the tripod’s legs just high enough to photograph the inlay. ….had to be photographed with the camera’s lens at its center. This meant suspending the camera without the tripod showing. While the legs on my tripod could easily span the inlay, the camera wasn’t high enough to show the whole feature. The solution? Rest each leg on a chair. The tethered view on the laptop confirmed the composition. Direct sunlight streaming in through the windows was controlled with a black panel from my lighting kit and a black and white checkered table cloth. Sometimes a successful shot requires improvisation. The rest of the shoot was relatively straight forward. Here are the results. The two exteriors were easy since I’d been at the location a few nights before and knew exactly when to make the exposures. There was one small issue. The lights in the cupola of the church were burned out. They were also 70 feet above the altar. After the interiors were finished, my assistant and I moved a heavy roller light stand and a triple riser column from a C-stand along with an 800 watt / second Dynalite pack and head into the church. We put the heavy roller stand behind the altar. The lightweight Dynalite head with a tungsten gel attached was mounted on the triple riser. It went into the top of the heavy roller stand. Finished, the assembly reached over fifty feet up. The flash was tripped with a Pocket Wizard remote trigger on the camera to add a slight warm glow at the bottom of the cupola. Was it a lot of extra work and gear? You bet! Was the client delighted with the result? Absolutely! The warm glow separating the cupola’s interior from the royal blue sky is from the flash. Thanks for sharing the process. It’s a pleasure to see how well-thought-out planning and meticulous habits produce amazingly flawless results.